The polar vortex has paid us another visit and we’re so hoping it’s for the last time. March is days away and more snow is in the forecast. More cold and snow can only mean one thing….more soup! The only good thing about cold weather is having savory, warm comfort food to ease the pain of a winter gone wild. 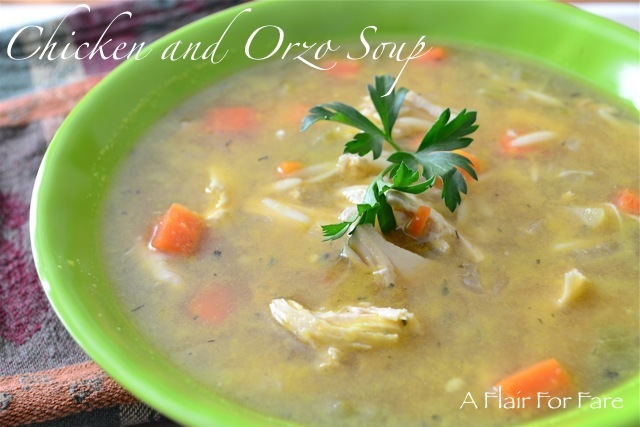 This soup comes together quickly, even faster if you use a store bought rotisserie chicken. Using a combination of stock and broth gives it a deeper, richer flavor which is enhanced by the addition of provencal herbs. Melt butter in large soup pot or dutch oven. Sauté the carrots, celery and onion on low heat until soft, about 5 minutes. Add minced garlic and cook 2 more minutes. Increase heat, add stock and broth and bring to a boil. Add herbs, salt and pepper and lower heat. Add orzo and simmer for 7 minutes. Add chicken and turn off the heat. Let sit for 5 minutes and serve. Makes 6 servings.